A promotional graphic showing a MQ-4C Triton overflying a RAN LHD. 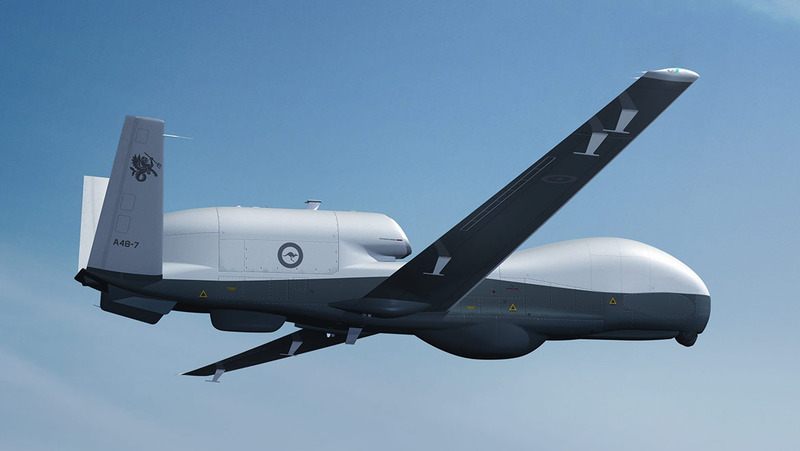 Australia is to acquire six Northrop Grumman MQ-4C Triton maritime unmanned aerial systems (MUAS), Prime Minister Malcolm Turnbull announced on Tuesday. The first RAAF Triton is scheduled to be delivered in mid-2023, initial operating capability (IOC) is planned to follow 12 months later, and a full operational capability (FOC) of all six systems is scheduled for mid-2025. Tuesday’s initial $1.4 billion program announcement covers the first of the six planned aircraft, which will be based at RAAF Base Edinburgh near Adelaide, and will include $364 million for the construction of new operational and support facilities at Edinburgh plus RAAF Base Tindal in the Northern Territory, as well as an initial ground support equipment, training and spares package. It also includes a $200 million investment in the US Navy-led Triton co-operative development program which will give Australia a seat at the table for future capability enhancements for the Triton, including the ‘Multi-INT’ signals intelligence package. “The Triton will complement the surveillance role of the P-8A Poseidon aircraft through sustained operations at long ranges as well as being able to undertake a range of intelligence, surveillance and reconnaissance tasks,” a joint statement by Prime Minister Turnbull, Defence Minister Senator Marise Payne and Defence Industry Christopher Pyne reads. Follow-on contract and production of the remaining five systems and the preferred in-service sustainment provider are expected to follow by mid-2019. The long-running project AIR 7000 Phase 1B requirement for an MUAS capability was reportedly approved by the National Security Committee (NSC) of Cabinet on June 19, just two weeks after the US Navy’s first two Tritons entered service at NAS Point Mugu in California and ahead of an ‘early operational capability’ (EOC) deployment to Guam from later this year. Triton can fly at altitudes above 50,000 feet and has an endurance of more than 24 hours. From RAAF Tindal, a single Triton mission can cover well up into the South China Sea or all of the resource-rich Northwest Shelf area out to the Cocos Islands and beyond. From RAAF Edinburgh, a Triton can reach and cover most of Australia’s Antarctic coastal area of interest in a single mission. Australia has long held an interest in acquiring an MUAS to work in conjunction with the Boeing P-8A Poseidon, 12 of a projected 15 which have been ordered under Project AIR 7000 Phase 2, to replace the maritime ISR capabilities of the AP-3C Orion. The 1987 White Paper stated a requirement for a “manifest capability” to conduct surveillance of Australia’s vast sea and air approaches, a capability which must provide the means to detect, identify and if necessary respond to sea and air activity in our sovereign air and sea space. As technology improved, the 1994 White Paper noted that a promising area of investigation is the use of unmanned aerial vehicles for surveillance of land and maritime environments. 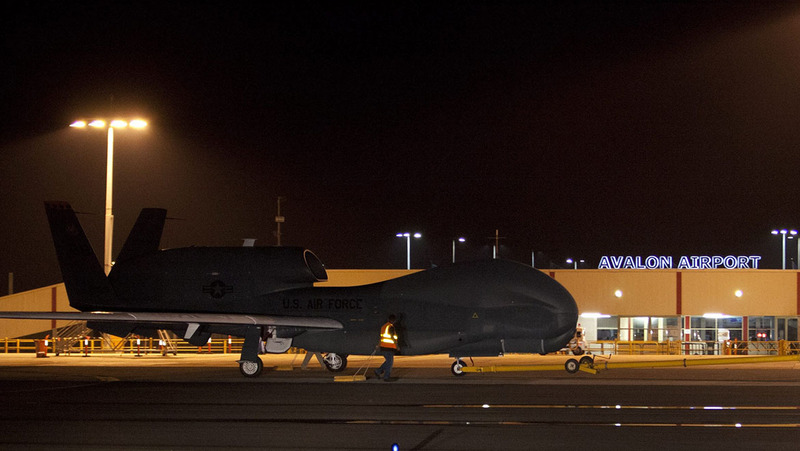 That ISR capability finally seemed within reach when the Global Hawk was developed by Ryan Aeronautical, since acquired by Northrop Grumman, to meet a US Air Force requirement for broad area overland surveillance to initially complement and eventually replace the manned Lockheed U-2. The first of more than 40 Global Hawks flew in February 1998, and a number of early Advanced Concept Technology Demonstration (ACTD) systems were pressed into operational service in 2001 immediately following the 9/11 attacks on the US. Global Hawk’s ability to fly intercontinental distances was amply demonstrated in April 2001 when an ACTD – temporarily dubbed Southern Cross II in honour of the first Pacific crossing in 1928 – flew non-stop from Edwards AFB in California to RAAF Edinburgh, covering the 13,219 kilometres in 22-hours. That was the first pilotless aircraft to cross the Pacific, and a world record for absolute distance flown by a UAV. In July 2006 the Howard government gave First Pass approval for participation in the cooperative development of a maritime Global Hawk with the US Navy, and in 2008, a ‘navalised’ Global Hawk won the US Navy Broad Area Maritime Surveillance (BAMS) requirement. 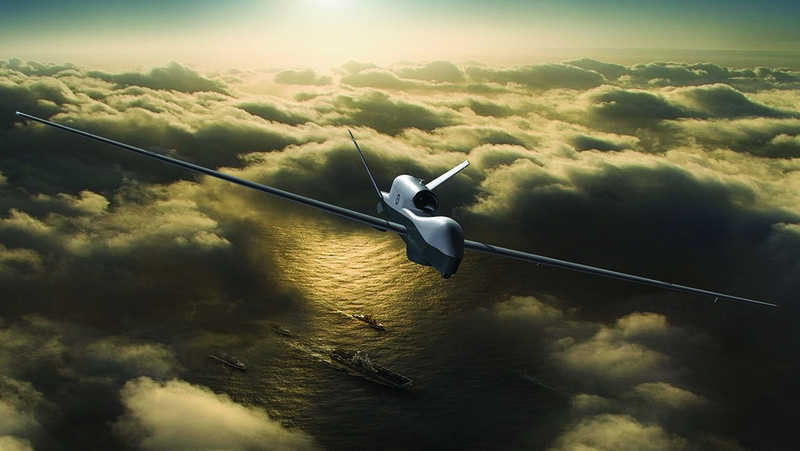 The Triton differs from the RQ-4B Global Hawk by having a stiffer wing, leading edge and engine intake de-icing, lightning and bird-strike protection, and the ZPY-3 Multi-Function Active Sensor (MFAS). Later enhancements will see a combined air-to-air sense-and-avoid/weather radar sensor added for operations in controlled airspace, and the Multi-INT sensor package. The Rudd government’s 2009 Defence White Paper made the key commitments towards achieving a mixed fleet of manned and unmanned maritime patrol aircraft – eight manned aircraft and up to seven large, high altitude, long endurance (HALE) UAVs. But later that same year the government reversed course and instead deferred its involvement in BAMS, citing financial and manning pressures on the RAAF as it transitioned from the AP-3C to the P-8A. The government confirmed its interest in acquiring the Triton by announcing in May 2013 that it had issued a Letter of Request (LOR) seeking further information from the US. A ministerial statement said the LOR would give Australia access to detailed information on the US Navy’s Triton, but emphasised that the release of an LOR had not yet committed Australia to purchasing the system. In early 2014 the then new Abbott government gave First Pass approval to acquire Triton, but the long-term schedule for the program remained somewhat ambiguous. Meanwhile, the 2013 Defence White Paper had committed to eight Boeing P-8A Poseidons, the first of which arrived in November 2016. The most recent Defence White Paper published in early 2016 upped the number of P-8As from eight to 12 plus three more options. The 2016 document also confirmed the acquisition of seven MQ-4C Tritons. Seven Poseidons have so far been delivered to the RAAF’s 11 Squadron at Edinburgh, with all 12 currently on order expected to be delivered and in operation by 2022. The last AP-3C Orion will be withdrawn from service in 2023, Tuesday’s joint statement confirmed. How the MQ-4C could look in RAAF markings. Max Blenkin contributed to this article. Can someone help answer please. How do these drones avoid civilian flights? Do they have collision avoidance? Why base in Adelaide and operate from NT? Tony, they will either (and more likely) climb and descend in the large restricted areas attached to Edinburgh and Tindal (and any other RAAF base actually), or at least in controlled airspace… which means ATC will be required to separate them from any civilian traffic. It’s also important to note that these are ‘remotely piloted’ aircraft NOT ‘autonomous’ (lost link and autopilot functions aside) so they are just like a regular aircraft except the pilots are not physically on board… they fly the aircraft and communicate with ATC just like every other aircraft in the airspace. Once they are up at altitude (45,000+) then, whilst they will still be subject to a control service (as there is controlled airspace everywhere from 24,500ft-60,000ft, there will be few restrictions on them getting what they need as there are generally only a few corporate jets operating up that high. Most airliners top out at 41,000ft and routinely your average domestic 737/320 will be down at 35-38,000ft. Given the most of the commercial jet traffic is operating in some form of controlled airspace most of the time the TCAS is a last resort separation device. Whilst I’m sure they would have some form of TCAS on board, it’s not meant as the primary collision avoidance device. You separate the aircraft and it’s requested flight plan from the manned traffic, just as you would if the aircraft was a manned aircraft (imagine a low flying U2). Adelaide (Edinburgh) base is simple really… you could ask the same of the P3’s being based there previously, and the P8’s now. It’s long been the home of RAAF maritime surveillance operations. Tindal simply means they can get to the South China Sea without stopping abroad for gas or limiting the time on station. Also very easy to secure as it’s a remote base, unlike Darwin which is a busy joint user facility which means flying in more densely occupied airspace (thus possible delays for operations), over populated areas (not ideal due to prying eyes and perceptions of unmanned aircraft generally) and to a base which has a large international airport on one side (prying eyes again). I read that the total cost was in the order of $7bn for the 6 unarmed aircraft & all the bits & pieces that go with it. Meanwhile, my wife gets kicked off the Disability Support Pension due to government cutbacks. I have no doubt the aircraft is an awesome, capable platform & entirely consistent with our long-range maritime recon needs, but as a nation more in debt than ever before, is this how we’re paying for it? The MQ-4C works in conjunction with the P-8, and it would make sense to base the two aircraft together. As for the collision avoidance, it would be similar to what they have on commercial aircraft during auto-pilot flights, and the triton does fly higher than most commercial aircraft anyway. Why o why Edinburgh I would have thought that Darwin would have been logical as our greatest threat of invasion ,and illegal boats are going to come from the North. Re collision avoidance, the aircraft will have a sense and avoid and weather radar fitted in time for FOC in 2025. Most of the time it is flying at 50,000 feet which is above most weather and all air traffic anyway, but it will require the radar to operate in or climb/descend through controlled airspace, and it will need a weather radar when operating from Tindal during the wet season. The Minister this afternoon confirmed the $6.9bn cost includes sustainment for the life of the program. It is unlikely this number is known, as the sustainment contract hasn’t been negotiated and is still at least a year away from being signed. This also sets an unusual precedent, as no other projects are announced this way. Two : for an Aircraft that can reach the South China Sea or Antartica, the flight to Tindall or Darwin is easy. Three : Who would want to raise a family 15ks out of Katherine, the RAAF has enough trouble getting people to go there now. At least the Ftr sqn personnal can be rotated back to Willy Town, the Triton personal would not have the same chance, they would be stuck at Tindall for their entire career. Four : Civilian support, 1 and 1/2 million people live in Adelaide, so plenty of Civilians to chose from, a couple of thousand in Katherine. 100,00 or so in Darwin but you already have a large ADF presence there. Yes the figure of $6.9b was certainly a ‘what the?’ moment when it was announced, but as has been clarified, it is the life cost of the program (the 2016 DIIP had a project figure of between $3b-$4b for the acquisition of seven Triton). Certainly very unusual for this to be announced that way, but it has happened once before (to the best of my memory). If we go back to the time when, then Def Min Brendan Nelson, announced the procurement of the 24 F/A-18Fs, the figure of $6.1b was announced, and everyone went ‘what the?’ then too. But as it turned out that was the total cost of procurement, ownership and operations for 10 years (which was the original 10 year ‘interim’ plan for the Super Hornet fleet). Anyway, great to see a commitment to at least six Triton at this stage (hopefully the seventh is also ordered), and to go with the seven P-8As delivered to date, out of 12 (hopefully that does get increased to 15). Any news on the progress of the five G-550s? Another article (which has eluded me now) confirms that these are for the RAAF. Another 3-4 P-8s would have been better because they can be armed as well!! If the ADF choose General Atomic’s Predator B under the future Project AIR 7003, that will be the RAAF’s armed MALE UAV option. The Triton and P-8A will compliment each other, we will eventually have 7 tritons and 15 P-8s(hopefully). The P-8 can’t fly at 50,000 feet and cover anywhere near the amount of area a Triton can. One of the Mission scenerios will see the Tritons sitting at 50,000 feet looking for targets and then the P-8 0r another asset will come in and take out the Target. All the weapons in the world are useless unless you know where the bad guys are. Whole of life costs for capital investments have been part of the Treasury required analysis for some time now. The number is always large and is to reflect the expected cost of the asset over time. I used to be big into this methodology, mostly used for option analysis, until recently for work. However after too many examples of adjusting numbers to support the option wanted and they inability to verify the case after the implementation of projects it has just become a “number” and because it is larger than the acquisition capital cost, politicians/executives them as an illustration of however much a of an investment/commitment to X they are making. Why RAAF Edinburgh? Simple geography. Its central. Its also closer to Darwin than Amberley. Detachments will operate from other locations, but Edinburgh will always be home for No. 92 Wing. @ Rhino Absolutely right – geography. Given the mission and area of interest, Adelaide is actually central and so flying time is about the same irrespective direction of travel. The P3 with its higher cruise speed compared to its predecessors meant that it was possible to locate both 10 and 11 Squadrons at Edinburgh and have a reasonable transit time. 10 Squadron relocated from what we used to call the FNQ Air Force based at Townsville before 5 Avn moved into the 35 Sqn facilities. There is a lot of infrastructure being built for the Tritons at Tindall, so regular detachments are going to be the norm. Geographicaly Tindal is best, but Adminstrativly and Logistically it would be a Nightmare. Are there still plans for the Tritons to operate through the Cocos or Keeling Islands during their Indian Ocean patrols?